The Band with Bob Dylan in 1974. 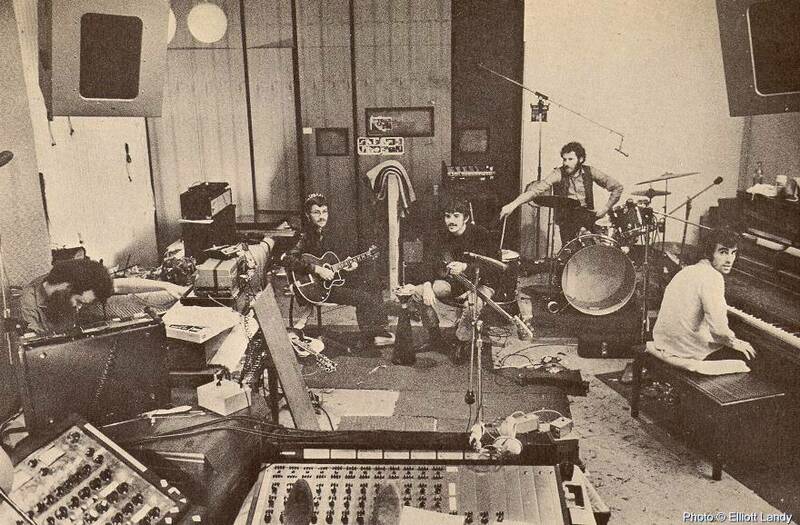 Left to right: Rick Danko on bass, Robbie Robertson on guitar, Dylan, and Levon Helm on drums. The Band was an influential rock music group active from 1967 to 1976. The original group (1967-1976) consisted of Robbie Robertson, Richard Manuel, Garth Hudson, Rick Danko, and Levon Helm. Originally known as the Hawks, the group became well known for backing Bob Dylan in 1965-1966 and then began recording its own material. The group's most acclaimed albums were its first two: the 1968 debut Music from Big Pink and 1969's The Band. Their song "The Weight," although not a major hit at the time, has become a much-covered classic of the era. The Band's music fused many elements, primarily country music and early rock and roll, although its rhythm section was considered reminiscent of Stax or Motown. Comprised of highly skilled multi-instrumentalists with several excellent singers, The Band's early work became extremely influential with other musicians. Their farewell concert, The Last Waltz, would become a highly acclaimed music documentary produced by Martin Scorsese, featuring some of the top acts in rock and blues history. The Band broke up in 1976, but reformed in 1983 (through 1999) without Robertson. Although The Band was always more popular with music journalists and fellow musicians than with the general public, it won lasting admiration and acclaim, and its songs have been much covered. The group was inducted into both the Canadian Music Hall of Fame and the Rock and Roll Hall of Fame in 2004. Rolling Stone magazine ranked them number 50 on its list of the 100 Greatest Artists of All Time. The members of The Band first came together as they joined Toronto-based rockabilly singer Ronnie Hawkins' backing group, The Hawks between 1958 and 1963. 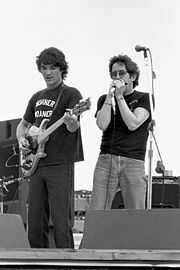 The group originally consisted of Canadians Robbie Robertson (guitar, piano, vocals); Richard Manuel (piano, harmonica, drums, saxophone, organ, vocals); Garth Hudson (organ, piano, clavinet, accordion, synthesizer, saxophone); and Rick Danko (bass guitar, violin, trombone, vocals); and American Levon Helm (drums, mandolin, guitar, bass guitar, vocals). Every member of the group was a multi-instrumentalist, enabling the musicians to create various configurations in service to the songs. Hudson in particular was able to coax a wide range of timbres from his Lowrey electronic organ. Singers Manuel, Danko, and Helm each brought a distinctive voice to The Band: Helm's southern style had more than a hint of country, Danko sang in a tenor, and Manuel alternated between falsetto and baritone. Though the singing was more or less evenly shared among the three, both Danko and Helm have stated that they saw Manuel as the Band's "lead" singer. The singers regularly blended in harmonies. Robertson was the unit's chief songwriter, singing lead vocals on only three studio songs released by the group. This role, and Robertson's resulting claim to the copyright of most of the compositions, would later become a point of antagonism in the 1980s when the bulk of songwriting royalties were going to Robertson alone. 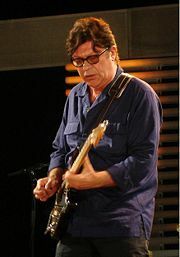 Producer John Simon is sometimes cited as a "sixth member" of The Band for producing and playing on Music from Big Pink, co-producing and playing on The Band, and playing on some other songs up through the Band's 1993 reunion album Jericho. 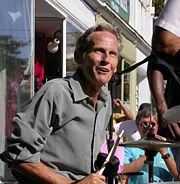 Upon leaving Hawkins in 1964, the group was known as The Levon Helm Sextet—the sixth member being sax player Jerry Penfound, then Levon and the Hawks, without Penfound. In 1965, they released a single on Ware Records under the name the Canadian Squires, but returned to the name Levon and the Hawks for a recording session for Atco later in 1965. At about the same time, Bob Dylan recruited Helm and Robertson for two concerts, then the entire group for his U.S. tour in 1965. With Dylan, they played a tumultuous series of 1965 and 1966 concerts, marking Dylan's final change from folk music to rock. These tours remain some of the most storied in rock music history. At their best, Dylan and the Hawks were an electrifying live ensemble. At the same time, Dylan and the group also faced heckling by folk-music purists. Helm was so bothered by the negative reception that he quit the group temporarily to work on an oil rig. Dylan did some recording with the Hawks, but he was dissatisfied with the results. However, Robertson replaced Mike Bloomfield as Dylan's primary guitarist on sessions for Blonde on Blonde, released in mid-1966. The album's credits also include Danko on bass and Hudson on keyboards and sax. In July 1966 Dylan suffered a motorcycle accident and retired into semi-seclusion in Woodstock, New York. The Hawks returned to the bar-and-roadhouse touring circuit, sometimes backing other singers, including a brief stint with Tiny Tim. They also joined Dylan in Woodstock to create a series of informal demos and jams, subsequently released on LP as The Basement Tapes. Reunited with Helm, the Hawks began writing their own songs in a rented, large pink house in West Saugerties, New York, near Woodstock. They originally thought to call themselves either "The Honkies" or "The Crackers," but these names were vetoed by their record label, who dubbed them "The Band." Initially, the group disliked the moniker, but eventually grew to like it, thinking it to be simultaneously humble and presumptuous. Their first album, Music from Big Pink (1968) was widely acclaimed. The album included three songs written or co-written by Dylan, "This Wheel's on Fire," "Tears of Rage," and "I Shall Be Released." Robertson's epic, "The Weight," would be used in the cult classic film Easy Rider and become The Band's best-known song, although it only reached number 63 on the US pop charts. The album would reach number 30, but was highly influential and is now considered a classic. In 2003 it was ranked number 34 on Rolling Stone magazine's list of the 500 greatest albums of all time. After the success of Big Pink, the band went on tour, including a performance at the Woodstock Festival and an appearance with Dylan at the 1969 UK Isle of Wight Festival. That same year, they left for Los Angeles to record their follow-up, The Band (1969). Less psychedelic and more country in flavor, the album stood in contrast to other popular music of the day, although several acts too went in a similar direction around the same time, notably Dylan on John Wesley Harding and The Byrds on Sweetheart of the Rodeo. The Band featured songs that evoked oldtime rural America, from the civil war ("The Night They Drove Old Dixie Down") to unionization of farm workers ("King Harvest Has Surely Come"). Rolling Stone lavished praise on The Band in this era, giving them as much attention as perhaps any group in the magazine's history. The group was also featured on the cover of Time Magazine's January 12, 1970 issue. A critical and commercial triumph, The Band helped establish a musical template (sometimes dubbed country rock) that later would be taken to even greater levels of commercial success by such artists as the Eagles and Alabama. Both Big Pink and The Band also strongly influenced other musicians, both Eric Clapton and George Harrison, among many others, citing the Band as a major influence on their musical direction in the late 60s and early 70s. Following their second album, The Band embarked on its first tour as a headline act. Pressure and fame produced visible anxiety, often evidenced in the group's music, as its songs turned to darker themes of fear and alienation. Their next album would be called Stage Fright (1970), recorded on a stage in Woodstock. The fraying of the group's once-fabled unity and sheer enjoyment in playing together was beginning to show. After recording Stage Fright, the Band was among the acts participating in the Festival Express, an all-star, rock-concert tour of Canada by train that also included Janis Joplin and the Grateful Dead. At about this time, Robertson began exerting greater control over The Band. Helm would later charge Robertson with authoritarianism and greed, while Robertson claimed his increased efforts in guiding the group were due largely to some of the other members being unreliable. The Band's next album, Cahoots (1971), included tunes such as Bob Dylan's "When I Paint My Masterpiece," "4% Pantomime" (with Van Morrison), and "Life Is A Carnival," featuring a horn arrangement from Allen Toussaint. The live recording Rock of Ages (1972), recorded at a New Year's Eve concert and bolstered by the addition of a Toussaint-arranged horn section, returned The Band to its previous exuberant form. Dylan appeared on stage for the concert's final four songs, including a version of his rarely-performed song "When I Paint My Masterpiece." In 1973, The Band released Moondog Matinee, an album of cover songs which garnered mixed reviews. Although they did not tour in support of the album, they did open for the Grateful Dead for two summer shows at Roosevelt Stadium in Jersey City, New Jersey and also played at the legendary Summer Jam at Watkins Glen on July 28, 1973. The festival, which also featured Grateful Dead and The Allman Brothers Band, was attended by over 600,000 music fans. The Band then reunited with Dylan, first in recording his album Planet Waves, released in January 1974, and also for the Bob Dylan and The Band 1974 Tour,produced by rock impresario, Bill Graham. The tour made 40 appearances in North America during January and February 1974. Each show featured an opening set by Dylan and The Band, then a set by Dylan, The Band played the third set alone, then the entire assemble to close the performance. Later that year, the live album Before the Flood was released, documenting the tour. In 1975, The Band released Northern Lights - Southern Cross, their first album of all-new material since 1971's Cahoots, with all eight songs written by Robertson. Despite poor sales, the album is favored by critics and fans alike. Highlights from the album included Helm's vocal on "Ophelia" and Danko's emotionally driven rendition of "It Makes no Difference." The album also produced more experimentation from Hudson switching to synthesizers, heavily showcased on the song "Jupiter Hollow." By 1976, Robertson was weary of touring. After having to cancel some tour dates due to Manuel suffering a severe neck injury in a boating accident in Texas, Robertson urged The Band to retire from touring with a massive Thanksgiving Day concert on November 25, at the Winterland Ballroom in San Francisco, California. The concert featured a stellar list of guests, including Ronnie Hawkins, Bob Dylan, Neil Young, Joni Mitchell, Muddy Waters, Dr. John, Van Morrison, Ringo Starr, Eric Clapton, Ronnie Wood, Paul Butterfield, and Neil Diamond. The concert was filmed by director Martin Scorsese and was subsequently combined with interviews, as well as separately recorded performances with country-singer Emmylou Harris ("Evangeline") and gospel-soul group The Staple Singers ("The Weight"). Released in 1978, the concert film-documentary, The Last Waltz, was accompanied by a triple-LP soundtrack. It is widely considered a classic representation not only of The Band, but of the spirit of the early-mid 1970s in rock culture. After one more studio record, Islands, The Band disbanded. In 1983, without Robertson, The Band reformed and recommenced touring. Several musicians were recruited to replace Robertson and to fill out the group. The reunited Band was generally well-received, but found themselves playing in smaller venues than during the peak of their popularity. While the reunited Band was touring, on March 4, 1986, Richard Manuel committed suicide in his Florida motel room. It was revealed later that he had suffered for many years from chronic alcoholism. Manuel's position as pianist was filled first by old friend Stan Szelest, then by Richard Bell. The reformed group recorded Jericho in 1993 with much of the songwriting being handled outside the group. Two more post-reunion efforts followed, High on the Hog and Jubilation, the latter including guest appearances from Eric Clapton and John Hiatt. The Band participated in former Pink Floyd leader Roger Waters' The Wall Live in Berlin concert in 1990, and in Bob Dylan's thirtieth anniversary concert celebration in New York City in October 1992. The group was also the opening act for the final Grateful Dead shows at Soldier Field, in Chicago, Illinois in July 1995. Helm received many plaudits for his acting debut in Coal Miner's Daughter, a biographical film about Loretta Lynn in which he played Lynn's father. He also won praise for his narration and supporting role opposite Sam Shepard in 1983's The Right Stuff. After struggling with throat problems and touring with his blues band, in which he rarely sang, in 2007 Helm released a new album, an homage to his southern roots called Dirt Farmer, which was awarded a Grammy for Best Traditional Folk Album on February 9, 2008. Rolling Stone magazine ranked him number 91 in the list of The 100 Greatest Singers of All Time. In 1984, Rick Danko joined members of The Byrds, the Flying Burrito Brothers, and others in the huge touring company that made up "The Byrds Twenty-Year Celebration." Several members of The Band performed solo songs to start the show, including Danko who performed "Mystery Train." Danko died of heart failure in 1999. Robertson became a music producer and wrote movie soundtracks (including acting as music supervisor for several of Scorsese's films) before a highly praised comeback, with a Daniel Lanois produced, self-titled solo album in 1987. He has been ranked number 78 in Rolling Stone's list of the 100 Greatest Guitarists of All Time. Hudson has released two acclaimed solo CDs, The Sea To The North in 2001, and LIVE at the WOLF in 2005, both featuring his wife, Maud, on vocals. He has also kept busy as an in-demand studio musician. The Band has influenced countless bands, songwriters, and performers. One of the most popular songs of the 1960s counterculture, "The Weight," in particular, has been covered many times, and in various musical styles. It is listed number 41 in Rolling Stone's 500 Greatest Songs of All Time list. The Last Waltz, The Band's farewell concert on Thanksgiving 1976, was turned into a timeless documentary by director Martin Scorsese. It is considered to be among the greatest rock and roll documentaries ever made. In the 1990s, a new generation of bands influenced by The Band began to gain popularity, including Counting Crows and The Black Crowes. In January 2007, a tribute album, entitled Endless Highway: The Music of The Band included contributions by My Morning Jacket, Death Cab for Cutie, Gomez, Guster, Bruce Hornsby, Jack Johnson and ALO, Leanne Womack, The Allman Brothers Band, Blues Traveler, Jakob Dylan, and Rosanne Cash, among others. In 2004, The Band was inducted into the Canadian Music Hall of Fame and the Rock and Roll Hall of Fame. The same year, Rolling Stone ranked them number 50 on their list of the 100 Greatest Artists of All Time. The group received The Grammy's Lifetime Achievement Award on February 9, 2008. All Links Retrieved February 15, 2009. This page was last modified on 23 November 2015, at 23:11.